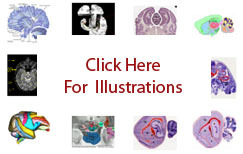 The term marginal sulcus refers to a superficial feature of the medial surface of the cerebral hemisphere found in the human and, though not ordinarily named, in the rhesus macaque (Macaca mulatta) ( Krieg-1975; Dubach-2008; Paxinos-2009a ). It is a caudal extension of the cingulate sulcus where the sulcus bends from horizontal to vertical and continues to the dorsal margin of the hemisphere. In the human it serves as the caudal boundary of the paracentral lobule with the precuneus ( Carpenter-1983 ). In the macaque it separates the superior parietal lobule from the precuneus ( Dubach-2008 ).